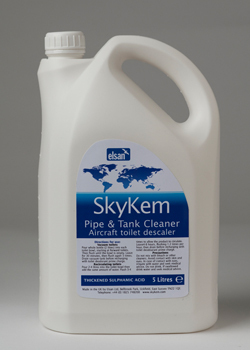 Skykem Pipe and Tank Cleaner is specifically designed to descale aircraft toilet systems in order to prevent pipe blockages or sensor, valve or flap failure. Regular maintenance prevents toilet problems that can force crew to lock down toilets. It also helps the toilet system to flush better and perform perfectly to prevent foul odours. In constant daily use aircraft toilets collect solid and liquid wastes that naturally form lime scale and calcium deposits throughout the toilet system. The build-up of scale prevents sensors from working properly and slowly blocks valves and pipe work. This immediately restricts the flow of water/waste and this causes bad toilet odours in the cubical and cabin. If left untreated the scale build-up will eventually cause the system to fail in flight frustrating aircrew and passengers and resulting in costly maintenance work and aircraft down time. Pipe and Tank Cleaner has been specially designed to deal with the build-up of scale deposits and helps maintain a fully functioning toilet system. Fast acting formula with optimised viscosity level to fully coat the system. Does not require hot water, works effectively straight from the bottle.. Safe for air and sea transport and safe for disposal to the sewage system. Passes every single protocol of AMS 1640B - check your current product achieves this. Always use SKYKEM toilet deodorant (sachets or fluids) to minimise the build-up of lime scale and other deposits. Usage guidelines for toilets on board the aircraft. Add 2 Litres of Pipe and Tank Cleaner to each toilet. (Crushed Ice is not required). Flush once then leave toilets to soak for 2 – 4 hours. After soak time flush the toilet with clean water and then empty the main waste tank. Pipe and Tank Cleaner should be used undiluted. (Crushed Ice is not required). Fill the Toilet pipe system with Pipe and Tank Cleaner back to the toilet bowl. Check aircraft manuals for levels/sequence to avoid overfilling any bowl in the system. Allow a minimum 4 hours before emptying the system. Flush with water to remove mixture and deposits. Empty the waste tanks before putting the aircraft back in service. Regular weekly cleaning programs – use Pipe and Tank Cleaner 50/50 with water. Crushed ice is not required. Empty all toilets and then add 2 Litres of Pipe and Tank Cleaner and 2 Litres of clean water into the toilet bowl. Flush each toilet twice. At every hour, flush each toilet 4 times to circulate the mixture. Allow the cleaning solution to remain in the system for 2 – 4 hours. Drain each toilet then rinse with clean water. General maintenance every 3 to 4 months - Pipe and Tank Cleaner should be used undiluted. Crushed ice is not required. Add Pipe and Tank Cleaner at full strength into the toilet filling the tank up to the toilet flap valves in the bowl. At every hour, flush each toilet 4 times to circulate the mixture. Allow cleaning solution to remain in system for 2-4 hours. Usage guidelines for any toilet parts removed from the aircraft for deep cleaning or other maintenance work. Use Pipe and Tank Cleaner at full strength or diluted 50/50 with water. Completely immerse components and allow full soaking until deposits have been penetrated and dissolved. Agitation with a suitable brush will dramatically reduce the soak time required. Once soaking has finished remove components from the mixture and rinse with clean water to remove mixture and deposits. Pipe and Tank Cleaner is not classified as harmful and is safe for air and sea transportation.